Chosen by the Kansas City Chiefs in the fourth round of the 2004 NFL draft, Allen was initially viewed as strictly a situational player who would add depth on the defensive line, but surprised by leading the team in sacks as a rookie with 9. 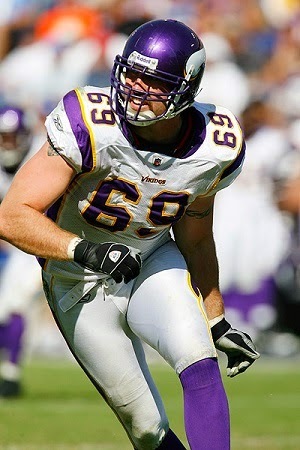 Intense, tenacious, and with good instincts, he followed up with 11 sacks in ’05 and improved his play against the run. Allen led the league in fumble recoveries in 2006 with 6, although his sacks fell to 7.5, and there was friction with the front office as well as a suspension from the league for a second DUI offense heading into 2007. Still, he led the NFL with 15.5 sacks in ’07 and was a consensus first-team All-NFL and Pro Bowl choice for the first time. The Chiefs traded him to Minnesota in the offseason where he continued to excel while a member of a stronger overall defensive line. Vikings went 10-6 to finish first in the NFC North while leading the NFL in fewest rushing yards allowed (1230). Lost NFC Wild Card playoff to Philadelphia Eagles (26-14). Allen recorded another 14.5 sacks and received All-NFL and Pro Bowl honors again in 2009. 2010 was a down year for the franchise as a whole, and Allen had a comparative off-year, although he still led the team with 11 sacks, his fourth consecutive season in double figures. He bounced back strongly with a 22-sack season in 2011 and was named NFL Defensive Player of the Year by The Sporting News as well as receiving consensus first-team All-NFL and Pro Bowl recognition. Allen followed up with 12 sacks in 2012 and was selected to the Pro Bowl for the fifth time. He registered 11.5 sacks in 2013 and signed with the Chicago Bears as a free agent for 2014. A bout with pneumonia caused Allen to lose 18 pounds, snapped a 113-game playing streak, and had him playing at less than full-strength. The defense as a whole suffered through a disastrous year and Allen’s sack total fell to 5.5. Through 11 seasons and 172 games, Allen has been credited with 134 sacks, as well as five interceptions and 19 fumble recoveries. He has been a consensus first-team All-NFL honoree four times in addition to the five Pro Bowl selections.